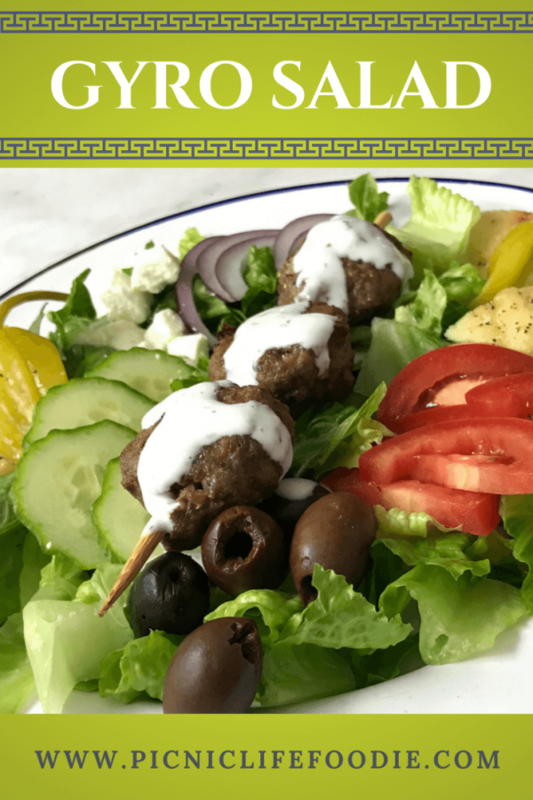 Gyro … tzatziki … words that make my mouth water. But how DO you pronounce these words? Well, for most of us it’s true. There are American pronunciations and Greek pronunciations. After a little web-searching I have decided to pronounce gyro (when referring to the sandwich) “yee-roh” and tzatziki “sat-zee-kee”. At least I know it is close enough to be understood when I want to order the Greek god of sandwiches! As much as I love the sandwich, there just isn’t enough room in that pita to fit all the vegetables I need in my diet. Enter the salad. My guys don’t even cringe when I say we are having salad for supper when this is on the table. A traditional gyro is made with lamb or pork on a rotisserie. My kitchen is not, and probably never will be, equipped with a rotisserie. 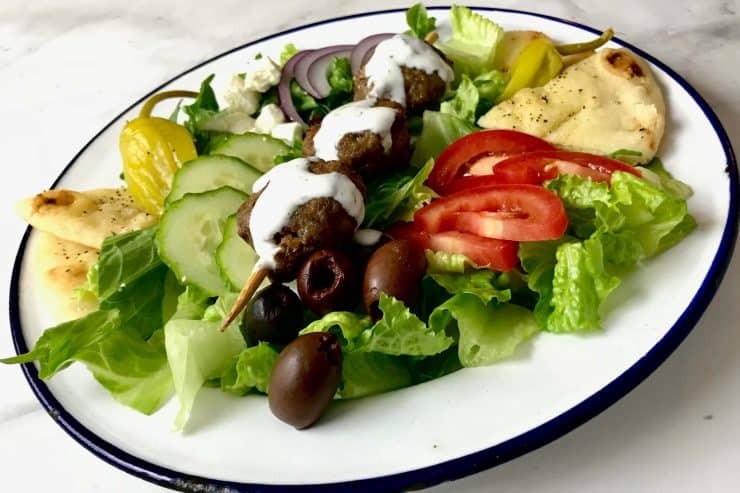 However, in my pursuit to give meatballs the love they deserve, I created a gyro meatball recipe using a combination of ground beef, pork and lamb. 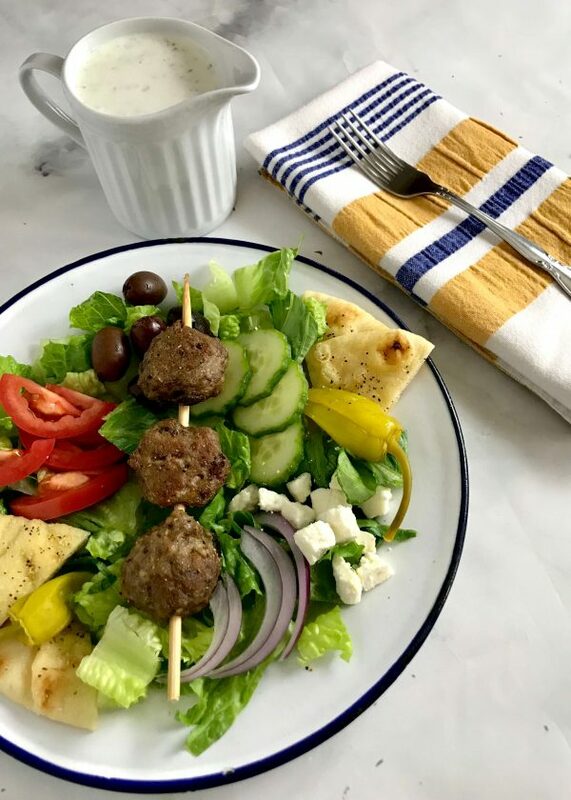 It may take some searching to find a store or butcher that sells ground lamb … and you can certainly make these meatballs using only beef and pork … but the result will be worth the effort. Grilled chicken breast seasoned with olive oil, lemon, garlic, oregano and black pepper is another great option for this salad. Garbonzo beans (chickpeas), pepperoncini, red/yellow peppers and fresh mint or dill are great additions/substitutions in this salad. Cut Pita or Naan bread into triangles and place on cookie sheet. Brush one side with olive oil and sprinkle with garlic salt and pepper. Broil on low for 1-2 minutes or until warm and golden brown. I wasn’t exaggerating when I said my guys really like this salad. My husband took leftovers to work for lunch today and my editor/son made an omelette with the meat, avocado and a little of the tzatziki sauce this morning. If our youngest son is reading this from college, he is groaning because he missed out on this meal. Maybe he misses this meal enough to make it himself?